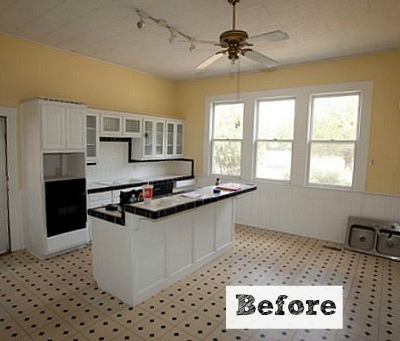 They replaced the linoleum with hardwood floors..
“We chose inset cabinets. 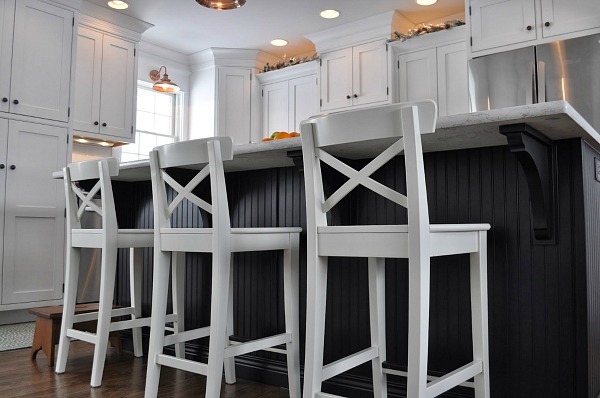 White Shaker style on the perimeter and black beadboard cabinets on the island. I love the copper lights too. It’s what our kitchen needed. Every country kitchen does. 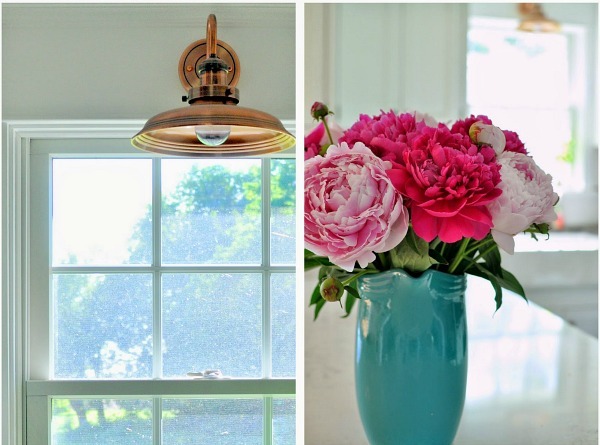 I think they are beautiful and add some much needed warmth to the room.” I agree! She says, “We love how it turned out,” and I can see why! 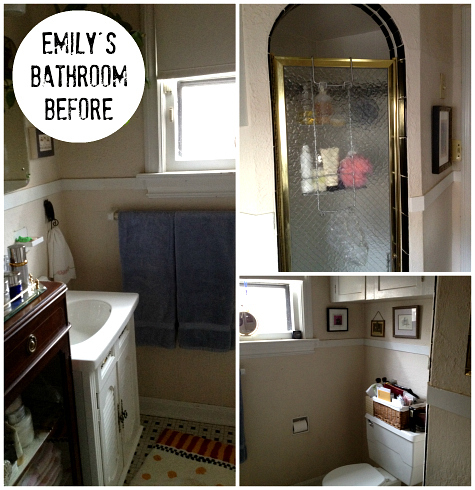 Thanks to Laura for sharing her kitchen makeover with us! For more photos and details, visit her blog A Nurse and a Nerd. 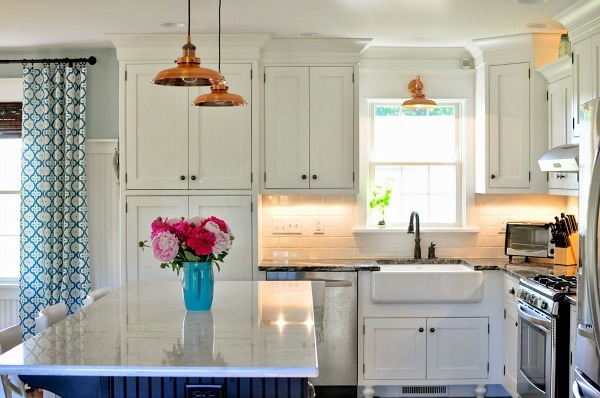 This delightful kitchen re-do has inspired me to spring for ‘warm’ metal light fixtures in our upcoming black + white kitchen. By ‘warm’, of course I mean copper or antique brass. This is a gorgeous kitchen! I love how they opened it up and those copper lights are beautiful – they add a lot of character. 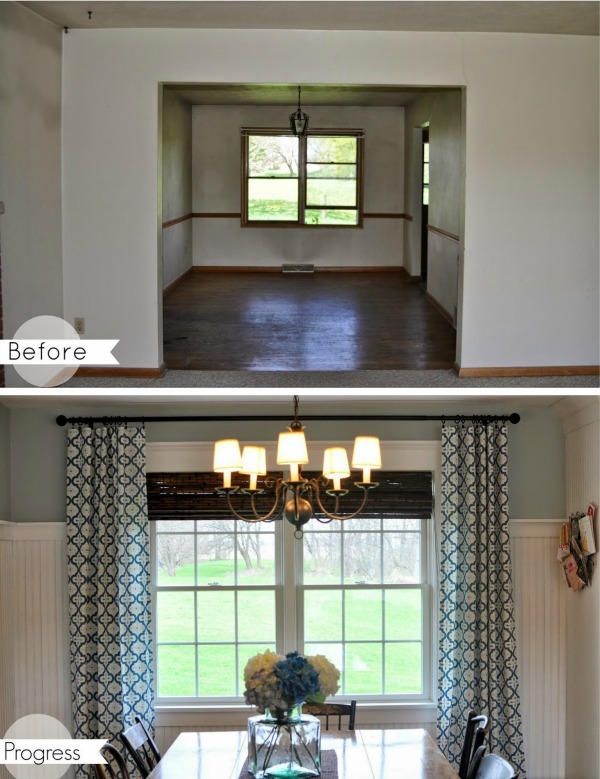 The curtain fabric really caught my eye too – it’s up to date but still has a cottage feel – so cute! I’m loving those curtains, too, JoAnne. So pretty! Amazing! You did a perfect job. 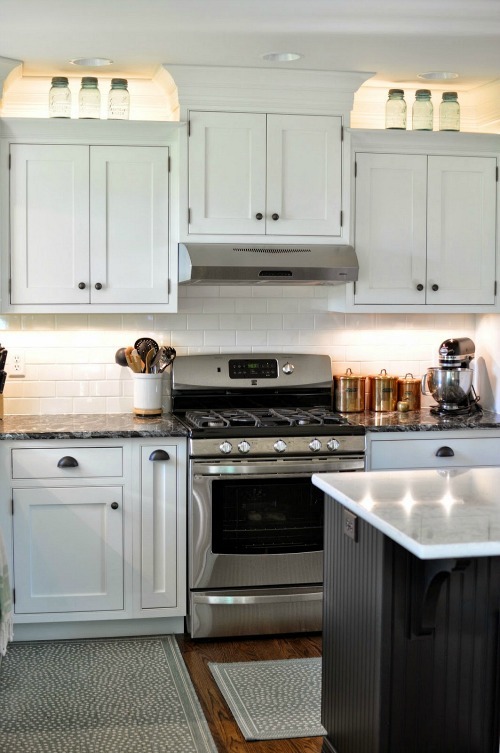 I am sure this kitchen will inspire many others attempting a remodeling project. What a stunning transformation! This is pretty much my dream kitchen. Um… mind?! That is fantastic!! Laura – looking over your blog, not only is your home lovely and a reflection of good planning and hard work, but the advice you offer about you AND your husband budgeting and then reviewing your monthly expenses is immensely valuable. I worked in banking for years and was so dismayed by the failure of borrowers–not just the first-time homebuyers–to understand household budgeting, the real costs of home ownership, and how consumer debt can sink dreams. Congratulations on letting common sense guide you both to your goals. Beautiful. The paint on the walls is gorgeous–not too nursery, too pre-teen, or too beachy, just cottage-y goodness. Hi Julia this makeover is just beautiful and the colour choices perfect. You realise I’ll be looking at my kitchen and because it’s morning over here I’ll be daydreaming with a sigh…. Thank you for sharing beauty. Regards Esther from Sydney. PS have a beautiful weekend. A Nurse and a Nerd is hands-down the best blog name, possibly EVER! 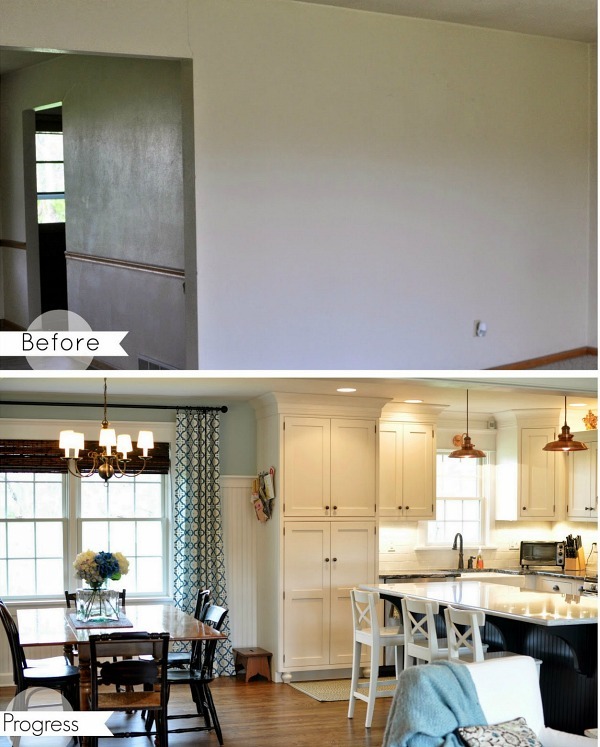 Curious to read more about this couple, after being absolutely transfixed by their gorgeous remodel, I clicked over to their blog and found that they also have one of the best blogs, too. So clean (easy on the eyes, which is a huge deal for me. I can’t read blogs that overwhelm or are too busy.) and informational. I also found this couple to be just really nice, and in addition to digging their style, digging their “person” is huge because in my world, nice still matters! This, new-to-me, blog just made my blogroll. Oh my goodness Destiny! I am so so so humbled by all your sweet words! I am so glad you have liked our little corner of the web. That seriously means SO much to me! I’m so glad to have you as a part of it! Nice matters to me to. Lets be friends! Wow! Fantastic transformation. I love the moldings and beadboard they used, too. Along with the new door, they really made a difference in the feel of the place. 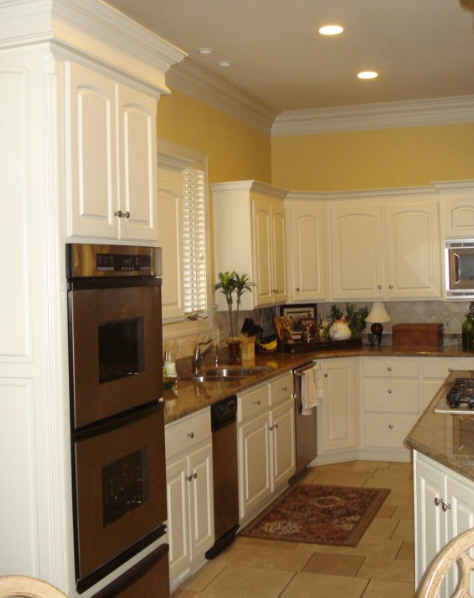 I like the mix of surfaces and the inset cabinets, too. Great job. 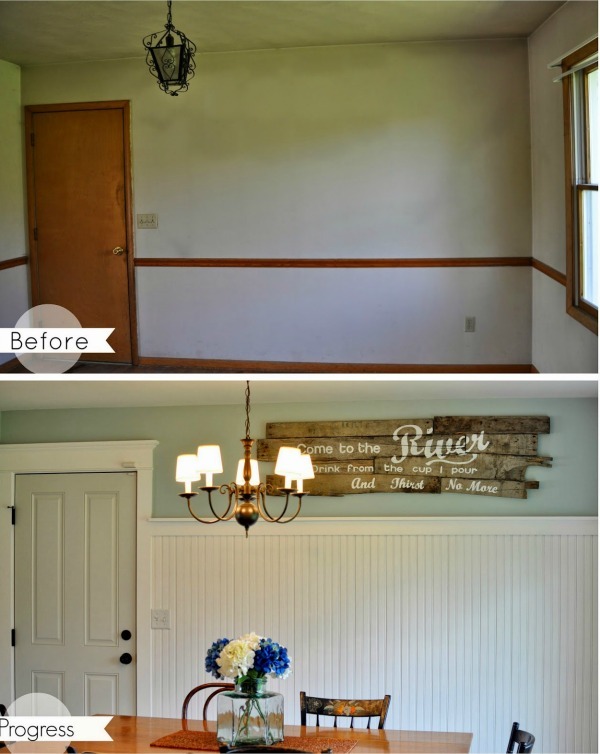 Love the height of the bead board in the dining room and especially that ” Come to the river…” sign. Nice touch. Yes, this was going to be my response as well! 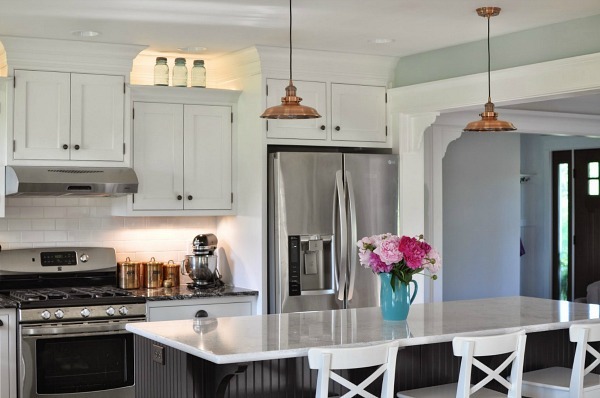 And those copper light fixtures are swoon-worthy! I love what they’re doing with this house. Every room looks amazing and I love the different touches they’ve made throughout. Like the breadboard, the curtains, and so forth. What a wonderful transformation! I can’t believe it’s the same kitchen! Wow! Love this kitchen- so inviting and beautiful. I envy the kind of vision they have as I look at the “before” photos! What a transformation! 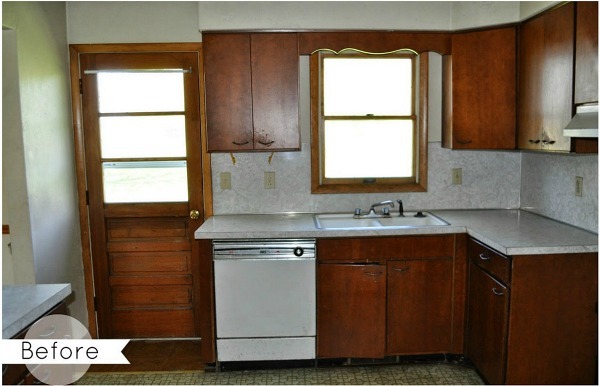 I love this kitchen – it is definitely updated yet they were able to keep the vintage look! Great job! 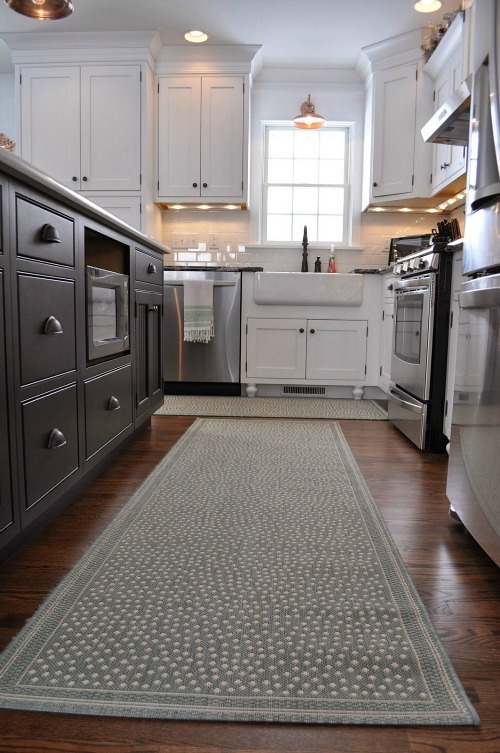 I love the rugs! Where did you find them? I need some new rugs for my kitchen. I got them from ballard designs. Such a beautiful make over! 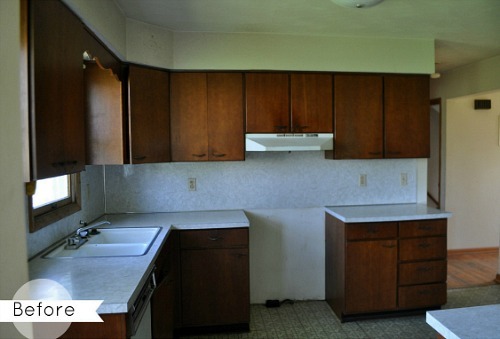 You have given me hope – we just bought a house a year ago and my kitchen right now looks like your before – we are hoping to remodel it within a year. Enjoy your new kitchen – may you make many wonderful meals and memories in it! My goodness, I gasped out loud when I scrolled down to see the “after” picture. WOW. Stunning — seriously!! Amazing job. Truly a kitchen that can be the centre of a stunning home.